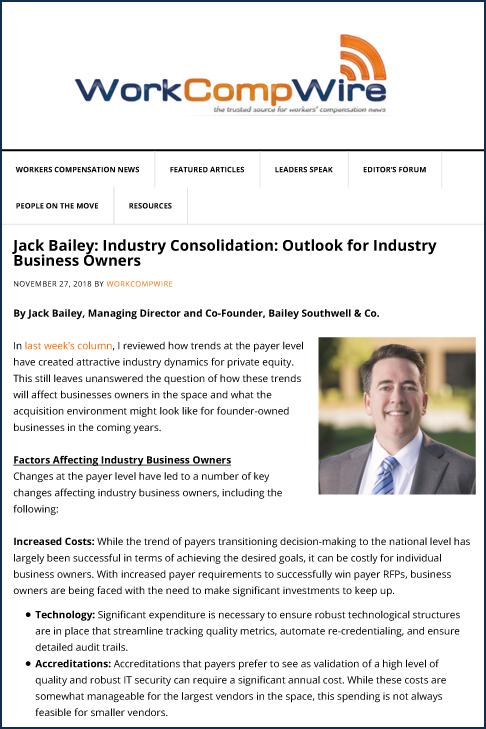 BSC Featured in WorkCompWire - Industry Consolidation: Outlook for Industry Business Owners (Part 2 of 2) | Bailey Southwell & Co. The first article by Jack Bailey, Managing Director, in WorkCompWire’s two-part series focused on how trends at the payer level have created attractive industry dynamics for private equity. In this second article, he discusses the question of how these trends will affect business owners in the workers’ compensation industry and what the acquisition environment might look like for founder-owned businesses in the coming years. Factors impacting business owners include increased costs associated with payers transitioning decision-making to the national level, as well as payers increasingly emphasizing the benefits of having multiple service lines. To address these changes, Mr. Bailey discusses the importance of focusing on top-notch customer service along with offering a partnership-attitude with customers. Addressing the impact at an operational level, the question then becomes how do these changes affect the M&A environment? Will there continue to be an environment with a steady flow of acquisition announcements where business owners are receiving historically attractive valuations for their businesses? Read Mr. Bailey’s full article by clicking here.